A few hours before you want to eat, combine the soy and hoisin sauces in a bowl. Whisk in the sesame oil and spices. Set aside. In a separate bowl, combine the half of the avocado with all of the mango and cilantro. Pour half of the soy marinade over the bowl. Cover and then refridgerate for at least an hour (2-3 will be better). Get your fish out of the fridge and put the two steaks in a plastic bag. Pour the rest of the marinade in the bag and refridgerate until ready to cook. A few hours later, now that you are ready to eat, heat the cooking oil on a skillet. While this is heating, spread the marinaded mango/avocado on the bottom of a plate to serve as the bed for the fish. Go ahead and dice your tomato while the oil is heating. In a bowl, toss the other half of the avocado and the tomato together. Take the fish out of the marinade and pat dry with a paper towel. Sprinkle with salt and pepper on each side. Sear the fish for about 60 seconds on each side, then remove from the heat. Place the fish on the pre-made bed of marinated goodness. You’ll notice that the avocado and mango are ugly and brown after marinating in that sauce. That’s why you have the fresh avocado and tomato! Arrange these around the fish and on top of the marinated bed. Garnish with a sprig of cilantro, serve, and ENJOY! **You’re going to need half of this avocado at the beginning stage and the other half you’ll need at the end. Instead of dicing the whole thing up front, cut the avocado in half. Take the half without the pit and use this half in the first stage (marinated stage). Use plastic wrap to cover the half that’s in tact, and then wait until the oil is heating to cut up this half. This approach will keep your avocado looking fresh and beautiful instead of getting brown. 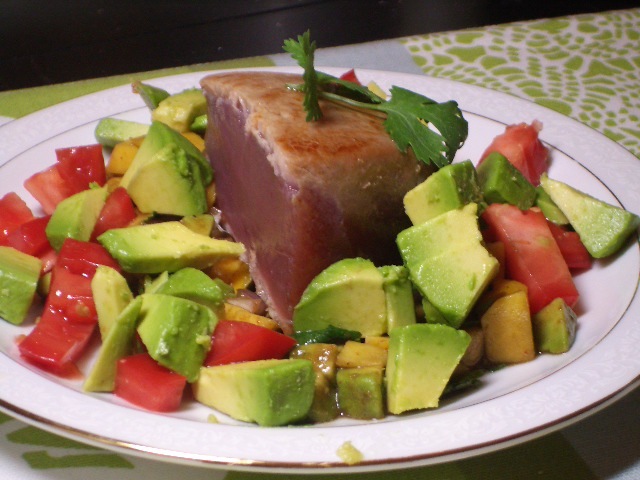 Can you believe in my 40+ years of cooking I have never done anything with fresh tuna steaks? Now, after reading through your post, I am determined to make this recipe. I love the fruit salsa and the asian flavors.